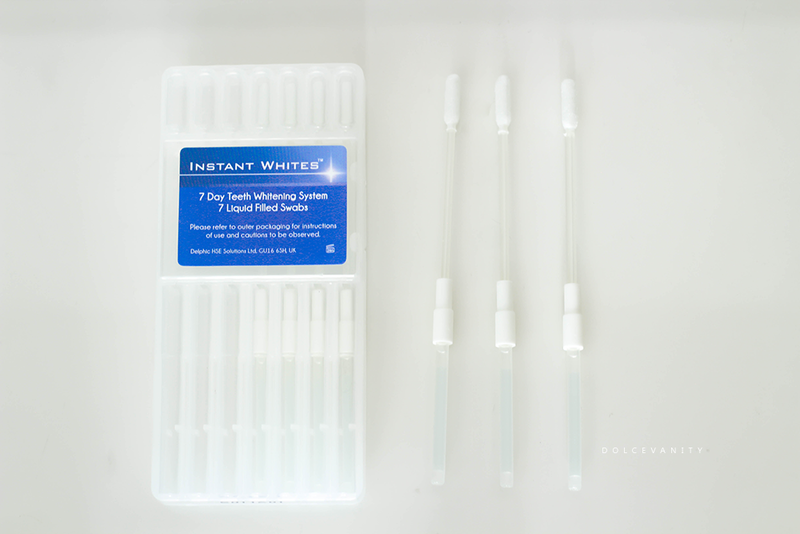 Instant Whites - 7 Day Whitening System Review. I've tried a couple of at home teeth whitening systems, never have I got my teeth done professionally, maybe one day but for now I seem to be content to try at home systems. Introducing Instant Whites - 7 Day Whitening System, a company I have never heard of before and the system seems to be done pretty differently from previous ones I've tried, it uses swabs. Within the plastic flip lid box are 7 liquid filled swabs, that are peroxide free and can be used on all tooth surfaces such as : natural teeth, caps, crowns, veneers, dentures and bonding. Instant Whites swabs are pH balanced to re-hydrate enamel by that I'm guessing it'll do less damage to the enamel. Ensuring the swab tip is in an upright position slowly begin to collapse both ends till the swab tip becomes moist with liquid. Use the swab tip to lightly rub and apply a small amount of liquid on the surface of all teeth to be whitened. A circular rubbing technique is recommended for 10-20 seconds per tooth, or 5 minutes covering all teeth. Rinse mouth with warm water after use. Do not eat or drink 30 minutes after - so this is why I use it at night before bed! That erm how to use, wasn't dummy proof for me, you basically keep the tip end upright (tip pointing to the ceiling) remove (slid down) the bottom half that has the liquid in and take off the white plastic holder that was in the centre. Now push the liquid tube onto the bottom of the tip and gently push upwards. I did this slowly because doing it too fast allowed too much liquid to be released through the swab meaning mess, less control and product!! It promises 9 shades lighter in 7 days...will that promise hold up? 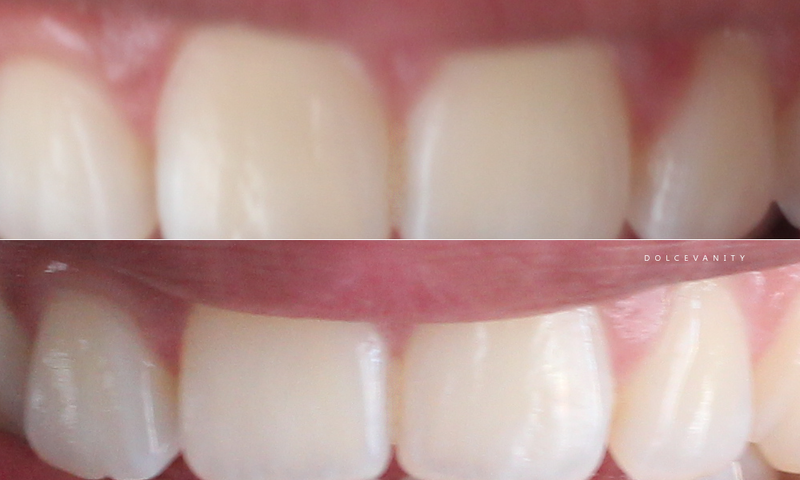 Not too bad with the whitening, it's nothing too drastic but I didn't know what to expect, so I wasn't expecting too much but I'm satisfied with the little lift. I didn't experience any sensitivity, during or after. It's currently £30 in Boots, I'm not sure if I'd bother to purchase it though, I'd probably would want more (whitening) for my buck but hey, can't have it all, there's a definitely a change even if it's a little! I'm always interested in trying whitening products but I'm so scared about ruining my teeth! You've got a bit of a result here which is a bonus. Sounds a bit fiddly though! Yeah the first time I was a bit huh lol but it's pretty simple once it's understood. Thanks! I use whitening toothpaste from time to time, but I'd be interested to try these! I just got a whitening toothpaste, it's nice to have something daily that'll just lift a little staining. I think it was a nice little change, the kind of thing you could get done before a wedding or a special occasion without wondering about irritation to gums or ending up looking like Ross on Friends. LMFAO that episode was jokes. OMG!! ... Yeah it is nice for special occasions totally agree. Wow you can see a difference there can't you, I might have to try this it looks great! I've always been curious about these systems. I'm glad this can be an affordable option. I've tried a few before but nothing as affordable like this. Your teeth seemed pretty white at the beginning too, so maybe you won't see a drastic change. Sounds like a real bargain though! Thank you, you could be correct with that one, good point! Great that you saw some results! I'm always dubious about these things. Definitely better to see some results than none at all. I'm pleased that you didn't receive any sensitivity - there's nothing worse! Oh I hate it, I already have slightly sensitive teeth so the fact it wasn't increased or continuous is a good thing. I think the results look great. I've always wanted to try a teeth whitening kit but for some reason I'm scared to. Hope that doesn't make me sound ridiculous! I know what you mean, you don't want to damage your teeth, with teeth, results are pretty much irreversible if it goes wrong. Yeah, I had the same thought doesn't give a huge lift. Such a shame it hardly worked for you. I have very sensitive teeth so whitening worries me but this product seems gentle so I will need to check it out! It does look like it worked, as you said nothing hugely drastic but there is certainly a difference. I would be worried about the sensitivity with teeth whitening but good you didn't have any. Yeah there's a difference but nothing drastic totally agree with you there. I have been thinking about trying this, as my teeth are pretty stained from coffee drinking. Ah top reason, this may help, being pregnant I'm sure you'd need something without harsh chemicals too. I'm with you, for £30 you want to see something significant rather than a little lift. It might not have been drastic but at least you tried it out. I would love to get my teeth whitened. Has to be done, don't try - never know. Me too, would love a uniformed colour.